If you own any type of lawn mower then there’s a minimum amount of maintenance that needs to be done in order to keep your mower running well. John Deere Mowers are very easy to maintain when you follow the recommendations in the Owner’s Manual. In a previous post I covered typical John Deere X300 yearly maintenance. One of the really important maintenance projects that I covered was lubricating all the grease fittings. Grease fittings are located on the cutting spindles, front axle spindles, front axle pivot and the deck lift lever. Using a grease gun and lubricating the grease fittings is an easy DIY project for anyone. If not using any of the preferred greases, be sure to use a general all-purpose grease with an NLGI grade No.2 rating. I recommend you use a grease gun like the one shown above. 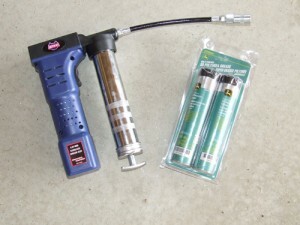 I recommend you buy the Lincoln Lubrication 1242 12 Volt DC Cordless Rechargeable Grease Gun with Case and Charger. My John Deere X300 has a 42 inch cutting deck on it. The 42 inch deck has two cutting spindles that need to be lubricated. 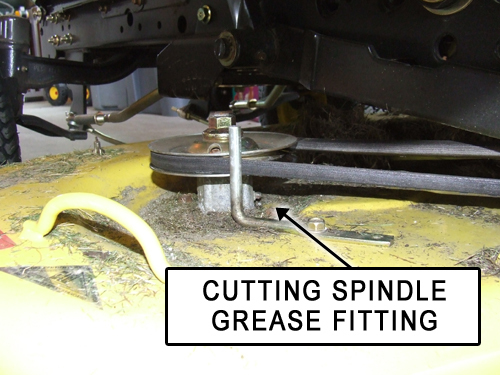 The spindle on the left side of the deck has a belt guard on it that needs to be removed in order to reach the grease fitting. To remove the spindle guard you’ll need to remove two bolts located on either side of the guard. In the photo you can see that I’m using a socket wrench to remove the bolts. Once you remove the guard it’s a good time to remove any grass and debris that’s built up under the guard. 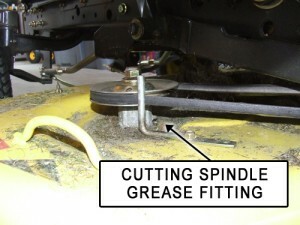 The grease fittings are located on the back side of the spindle. Attach a grease gun to the fitting and pump one or two pumps of grease into the fitting. When the spindle is full of grease you’ll see a small amount of grease squirt out around the fitting. The next parts that needs to be lubricated are the front axle spindles. The axle spindles are very easy to located, they are located on the rear side of the left and right front axle spindles as shown in the photo. Again you’ll want to use one or two pumps from the grease gun until you see a small amount of grease squirt out of the fitting. You’ll also need to lubricate the front axle pivot. 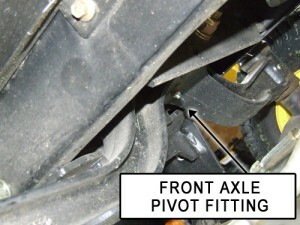 The front axle pivot is located in the center of the front axle assembly on the bottom as shown in the photo. This grease fitting is hard to see unless you get on your back and look up under the front end of the mower. The final grease fitting that needs to be lubricated is the mower deck lift pedal. 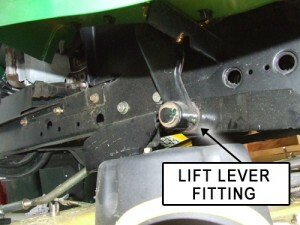 As you can see in the photo the grease fitting is located at the bottom of the mower deck lift pedal. 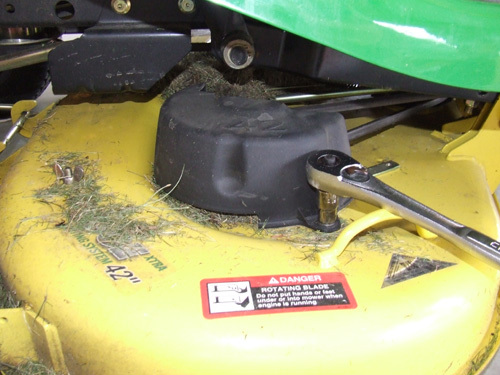 Maintaining your lawn mower according to the manufacturers recommendations is essential to performance and longevity. I’ve been changing the oil, filters and lubricating my mower as recommended by John Deere. I have no doubt that it will continue to perform like the day I bought it. Ifind your info on John Deere Greasing very up to date and correct . 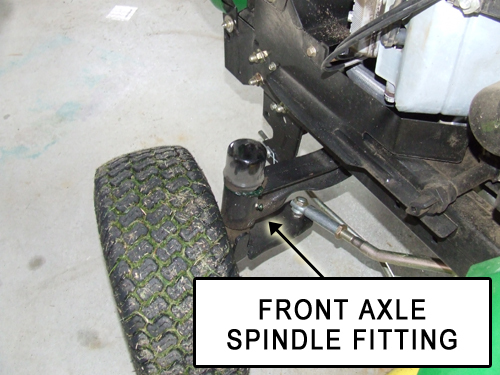 Can you advise me on how to grease the rear axel of my J/Deere ride on mower ,which we bought in Queensland Australia ,after owning 2 previous ride on products ,we find The J/DTo be very efficent . Post a letter if thats at all possible . @ Rodger – I have a feeling they are sealed axle units. I haven’t seen a grease port on them. I have my JD deck so I can easily get to the fittings but they fitting will not take grease. The fittings themselves done have a hex so how do you get them out? Have to remove the whole pulley and blade to get them out to where it may be possible to get a vise grip on the grease fitting. Are they screw in or factory pressed in? Thanks! You have really helped me. I have a John Deere 2016 Model X300. 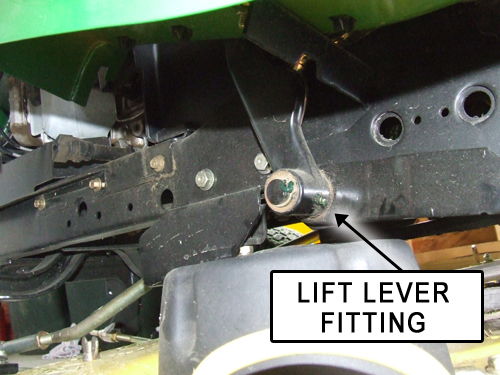 In their great engineering, they put grease fittings on the mower spindles, on the top of the retaining nut, but the fittings point straight up and there is no way possible to get a grease gun positioned so that it will grease, due to the frame of the mower being in the way. Why in the world they did not put offset 90 degree grease fittings on the spindles, or ever an offset 45 degree fitting would be ok. I’ve tried to change the fittings and the size of the threads is an oddball size, with a 7 millimeter fitting being too small and and 8 MM is too large. I had to tap the threads to an 8 mm size and install 90 degree fittings on both mover spindles. I wonder sometimes where common sense is when it comes to engineering…Thanks! Grew up without a father so all of these projects are lookups online. I appreciate you taking the time to post! There are 90 degree fittings for grease guns. You da man! Thanks for taking to to write this!